A subscription. Know someone with a passion for fashion, food, wine, news & analysis, hunting, fishing, hiking, camping, or pretty much any other hobby? Gift a subscription to a specialty publication or box deliveries that shows you are paying attention and honoring their passions. A lesson. Consider your own personal talents. Is there someone on your list who admires something you do and would love to emulate it? Assemble and gift supplies for the activity combined with a personal lesson or two from you. Example: a favorite family recipe + ingredients + a co-cooking or baking session. Some knowledge. For the person who loves to learn new things, consider gifting tuition for classes or online courses. For digital options, check out sites such as Udemy, Masterclass, Lynda, CreativeLive, and Skillshare. An experience. Many will say they prefer receiving experiences to things. Virtually all tickets and passes—for concerts, plays, musicals, sporting events, expos, ski lifts, golf outings, movies, museums, botanical gardens, and other local attractions—can be purchased online and printed right at home. Services. 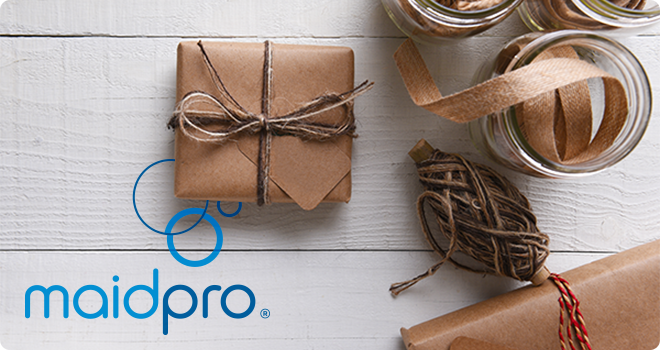 Services such as grocery delivery, dog walking, landscaping, personal care, and professional home cleaning by MaidPro make great gifts too. Two good ways to think about gifting services: Is there someone on your list who is either too busy or too frail to do a particular chore around the house? OR, is there someone you know who would LOVE a particular service, but would feel guilty spending money on it? Donations. There are three great ways to incorporate donations into holiday gift giving. One, you can donate to a cause or organization (like MaidPro Cares, who helps orphaned children worldwide) in someone’s name. Two, in lieu of gifts, ask friends and family to donate to a favorite cause in your name. Three, convince your family and/or friend group to pool the funds they would have spent on gifts and make a group donation. Something handmade. Even if you are not the craftiest person in the world, there is virtually no limit to the ideas and step-by-step instructions you can find online for making gifts by hand. What’s more, the fulfillment you receive from the simple act of creating is a great gift for you too.